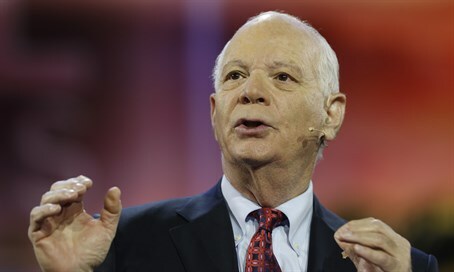 Even as the Obama administration expressed its approval of the EU decision to label Jewish goods from Judea, Samaria, eastern Jerusalem and the Golan Heights on Thursday, a bipartisan group of Congressmen called on the government to take action against it. While US State Department spokesperson Mark Toner said the EU move Wednesday was a "technical" matter and "not a boycott," the Congressmen wrote in a letter to US Trade Representative Michael Froman that the labeling clearly is not just a technicality. The letter was sent by Congressman Peter Roskam (R-IL), Congressman Juan Vargas (D-CA), Senator Rob Portman (R-OH), and Senator Ben Cardin (D-MD), Ranking Member of the Senate Foreign Relations Committee. In it, they called on Froman take action with the European Commission given that Trade Promotion Authority (TPA) legislation passed earlier this year forbids BDS boycotts of Israel. “We are writing to express our deep concerns regarding yesterday’s announcement by the European Commission for new labeling requirements of Israeli goods produced over the green line," wrote the Congressmen. "Though billed as a technical consumer education ‘fix,’ such policies can, and indeed should, be viewed as part of the European Union’s (EU) larger campaign to try and impose borders on Israel outside of a negotiated peace process by differentiating between pre- and post-1967 Israel," they added, referencing the 1949 Armistice line. "This is exactly the kind of activity we had anticipated when we authored the provisions related to the boycotts, divestment and sanctions (BDS) movement against Israel in the Trade Promotional Authority (TPA) legislation that was signed into law by the president on June 29, 2015." In a call to action, they wrote to Froman: "we strongly encourage you to utilize the anti-BDS provisions in TPA to weigh in with the EU to express opposition to these new labeling guidelines and any further actions they might be contemplating to restrict commerce with Israel, isolate Israel and exert unilateral economic pressure on Israel to make political concessions outside of the negotiating process." "To help us ensure continued oversight on this critical issue, please provide an update on this matter by December 1, 2015." The talk of the EU taking further steps to pressure Israel follows the assessment of an expert at NGO Monitor who spoke to Arutz Sheva about the labeling on Wednesday, and revealed that the move is the first step in a planned total boycott of Israel based on the stated goals of the groups who brought about the labeling.